The A-S700 was tuned with three objectives in mind,â€™ he told Australian Hi-Fi Magazine. â€˜To naturally produce the harmonic constituents of violins and other high frequency instruments, to express the rich texture of the human voice and guitars and other midrange instruments, and to prevent the bass of kick drums or orchestra from losing its deep feeling and weightiness. Itâ€™s because of this that the A-S700 is able to fully convey not only the clarity, but also the joy of music. Sounds great with impedance switch set to high connected to Klipsh RF 800 speakers. Didn't try to bi wire. Played all kind of sources including turntable. Also connected to Sony Hap S 1 hi res audio player and played Flac files 24/192, DSD plus SACD recordings via Sony blue ray player. I bought this amp as # 3 owner in great condition and paid only $ 250 CDN For this money you can't complain. It's like day and night compare to Sony Hap S 1 amp which was to weak to drive Klipsh RF 800 Mentioned speakers became like new born. I think it depends a lot on the speaker set connected. I heard this amp connected to expensive Focal floor standing speakers which are way more expensive than my Klipsh and I didn't like it. So maybe not to bright sounding speakers are getting benefit of being connected to this amp. And bass is fantastic listening on loud or low volume. Everyone has different listening preferences and for me this amp is a steal. This is the best sounding Yamaha amp I’ve heard regardless of price. Unbelievably smooth, clear, dynamic and tonally correct with most neutrally balanced med to high efficiency speakers. The amp will not perform its best when driving very low efficiency (<85db) ultra low impedance multiway floor standers and panel speakers but that really is its ONLY limitation. Amazing sound quality for the price. I purchased the amplifier in 2012 (the drop down for model year ended at 2010). It replaced a mid-1970s Yamaha CR-2020. My A-S700 is teamed up with a Yamaha TX 950 (tuner) and a Yamaha CDX 1030 (CD Player). The living room is equipped with a pair of B&W Matrix II Speakers (series one) and a pair of KEF C-200 passive subwoofers. The study is equipped with a pair of B&W Matrix I Speakers (series two). The sound in the living room and the study is fabulous. The A-S700 has no problem powering the Matrix II and KEF subwoofer combination. The highs are precise, the mid-range clean and the bass clear (no mindless rumbles here). The B&W Matrix I Speakers are in a smaller room; which is filled by the crisp presentation from the Yamaha. I recommend highly that anyone using the A-S700 or other good equipment invest in a top-end CD Player. I replaced a Denon CD Player with the CDX 1030 after I purchased the A-S700 and noticed a distinct improvement in the quality of the music. I was able to purchase my A-S700 for about $500 as an new but open-box item. What a deal! I just purchased the A-S700 off of ebay two weeks ago and I am so pleased with it that I decided to go ahead and write my first review. Let me start by saying that I have been an audiophile for 21 years now and have owned a wide variety of medium priced gear over the years. Normally the gear that I buy falls into the $1,000 to $2,000 dollar range. Most of the time I get good discounts on new gear or just buy used so rarely do I ever spend over $1,000 on anything. Most recently I have had the challenge of putting together a completely new system on a tight budget so this is how I ended up with the A-S700. When I originally put this system together I really wanted to get the Yamaha A-S1000 amp but due to a tight budget I ended up with a very nice Denon PMA-2000ivr integrated amp that originally retailed for $1,200 and I got off of Audiogon for $450. I searched high and low for weeks for the best amp I could find for under $500 and the Denon was by far the best value for the money. The build quality of the Denon could not be beat at that price. The Denon had everything I needed and was built like a tank weighing in at 52 lbs. I loved everything about the Denon except one thing...the sound. Boy was I disappointed with the sound of the Denon. Overly warm, dark, soft, slow and rolled off on the top. Basically a marsh mellow sound that I absolutely could not live with. On the plus side the Denon did have a very big sound stage and was even a bit holographic on certain cuts but for me it was just way too warm. Granted, others might love a warmer and darker sound but when a overly warm or darker sounding component comes into my system it is usually gone in days. In comes the A-S700. Yamaha saves the day again. Open, clean, clear, crisp, extended and accurate with just the perfect touch of warmth in the mid-range. Actually, the warmth in the mid range is one of the Yamaha's best attributes. Normally one would expect an amp with the above characteristics to sound a bit on the clinical side. Not so with the A-S700. The A-S700 retains the neutrality of much more expensive amps yet achieves a nice, musical mid-range at the same time. I would go as far as saying that the A-S700 has a liquid mid-range. How the engineers at Yamaha achieved this kind of neutrality and musicality at the same time is anyone’s guess but my hat is off. My first reaction when I heard the A-S700 right out of the box was to say to myself that I could now hear my Rega/Grado/Jolida magic coming through. I first attributed the nice mid-range to my tubed phono stage but as I went back and forth to my CD's I could still hear the magic in the mid-range. If anyone out there is reading this and wants a warmer and darker sound then go with the Denon. If you want neutral plus musical then go with the A-S700. I know that if I had a grand or two to drop on an amp today I would just upgrade all my cables instead. The A-S700 is the perfect amp for me. I purchased the Yamaha A-S700 brand new off ebay for $350.00. It was an impulse buy just to check out Yamaha's new line of integrated amplifiers. I have owned a few other Yamahas in the past including the RX-V3000 AVR and the AX-592 integrated amplifier. There was nothing wrong with either of those units but neither really stood out as being special. My current system consists of Dynaudio Contour 1.3 SE speakers ($3500.00/pr. ), a Krell KAV-300r ($3250.00), a Pioneer BDP-51 FD blu ray/CD player, a Dual CS-455 turntable and a Creek OBH-8 SE phono preamp. Upon unpacking the Yamaha I was impressed by its very nice fit and finish and substantial weight. It is full of very high quality Elna and Nichicon Fine Gold capacitors, uses a C-core transformer and it is layed out very neatly inside. The faceplate finish is flawless, the knobs have a nice smooth, sturdy feel to them, the remote works well, is pleasing to look at and provides a very nice feel in hand. Around back there are gold plated inputs for CD, Phono, Tuner, Aux 1, 2, a tape loop and two pairs of middling quality binding posts. I placed the Yamaha in the space where the Krell normally resides and commenced listening (all listening was done pure direct mode). I will start off by saying that this is the best Yamaha amp that I have ever listened to...Period! It is unfailingly neutral sounding with a very good midrange and treble balance. The bass is deep, authorative and well controlled, not boomy nor sloppy. Imaging is pinpoint precise with excellent soundstage height and width and good depth. The Dynaudio speakers have an impedance of 6 ohms and only 85 dB sensitivity, they are not an easy load for an amplifier. The A-S700 sounded fantastic playing into the Dyns. I listened to jazz, blues, country, hard rock, rap, and metal, CDs and LPs. Many amplifiers have come and gone through my door, including, Bryston 3B, Arcam FMJ A22, YBA Design YA201, Proceed Amp 2, Consonance A100, NAD C320BEE, Krell KAV-300iL and 400xi, and the aforementioned Yamahas. IMO this new Yamaha ranks right up near the very top of the list regardless of price. It is not quite perfect though. It does not have the bass power of the Krell 300r nor the dynamic reserve. The Yamaha shows signs of strain at volumes the Krell is loafing at (very loud!). This minor criticism is easily solved by using higher efficiency speakers. At any sane volumes the Yamaha has plenty of power. The biggest weakness of the unit is the onboard phono stage. It is not bad just bland. It is acceptable but if you like vinyl you will want to get a better phono preamp. The Yamaha is a very, very quiet amplifier! The only amplifier that I have ever heard that was quieter was a Class D PS Audio GCA 250. I have found a detailed bench test of this amplifier done in Australia and it confirms my thoughts. The A-S700 has astonishingly low distorion and quite a bit more power than its rated 90 wpc, with near 200 wpc available into 4 ohms. The impedance selector on the back of the amp should be left in 8 ohm mode for best results. Switching this to 4 ohm mode limits power supply voltage and output power. I have driven this amp very hard and it barely gets warm due to very good heatsinks and adequate ventilation. The Yamaha A-S700 sits in a tough area in the audio business. Audio snobs will not give it a second thought, they will look to Bryston, Simaudio, Krell, McIntosh, etc. The mid-fi shopper will probably bypass it because of the Yamaha name and go for Arcam, NAD, Cambridge Audio, etc. The people that do buy the Yamaha will probably connect it to middling quality speakers and never have a clue how good the amplifier is. Bought this from Best Buy for 270 as an open box item for my masterbed room system. Best Buy didn't have the remote so had to go to Yamaha and bought a replacement for another $65. But for $335, I feel like this is a great buy. Using it with Mirage OS³-FS speakers. This amp sounds real good. I'd describe the sound as smooth without any glare or etched highs. The bass is solid but not the last word in punch. This is the kind of amp that just sounds good without a lot of flash. It just allows the music to flow with out calling attention to itself. If you're looking for a solid performer - something you can live with for a long time. Give this amp a listen. I bought it last month in Singapore at SGD900.00 and after 50hrs break-in period, I have made comparison to my old Marantz PM7000, this Yamaha A-S700 is a clear winner for VERY smooth, open, transparent and natural sound. 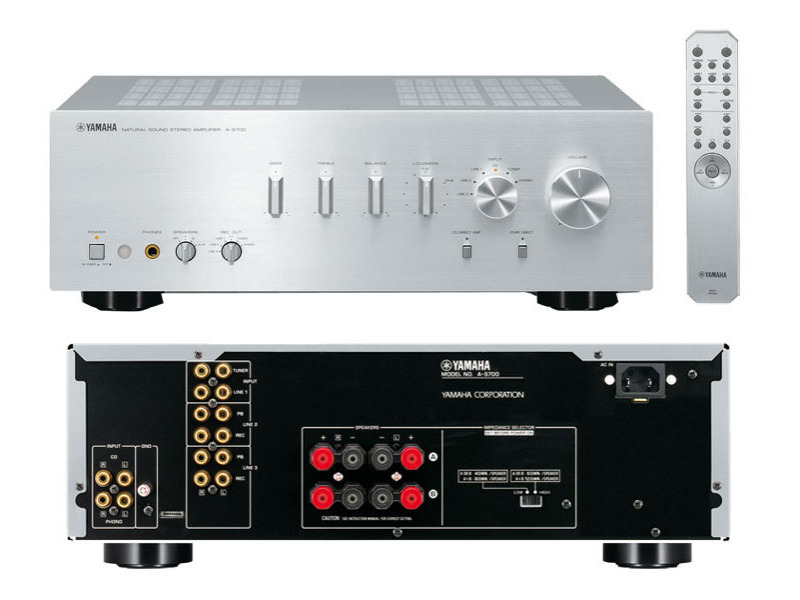 Although Yamaha A-S700 has less dynamic power as compared to other brands' amplifier, But its dynamic power is still GOOD ENOUGH for playing pop music, classical, jazz, country, audiophile music,english oldies, 70' & 80' disco music & etc.... NOT FOR HEAVY METAL, HARD ROCK OR LOUDNESS WAR MUSIC. If you want the "Natural sound " only, Yamaha A-S700 is 100% strongly recommened ! !